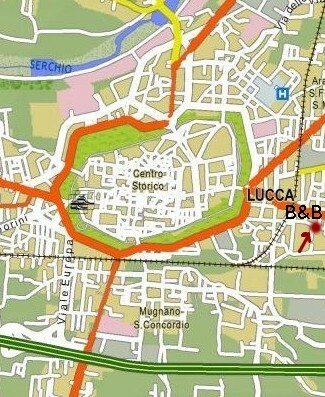 B&B located in a old farmhouse just 3 km from the historical centre of Lucca. 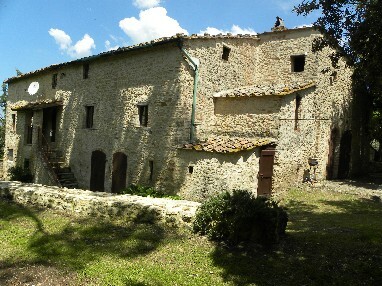 Even if in the immediate outskirts of the town, the farmhouse is surrounded by green fields. In this environment there has been created a delightful city farm with typical plants and animals of the local rural tradition. Outdoor area, 3 double rooms with private bathroom, towels, television and the possibility of adding a single bed or a small bed for babies. Private Parking and free bicycles provided to reach the town centre. On request lunch and dinner can be served in the dining lounge. 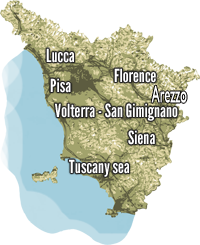 This is an excellent place to spend a holiday where you can relax and visit one of most beautiful town of Tuscany. bathroom with shower, cot for baby on request,TV sat,central heating in the bedroom and bathroom,air fan on request,3 different sizes towels per person,set of sheets and blankets,electric hairdrier,exterior shutters, final cleaning. huge continental breakfast, free parking, free bicycles available, free internet connection, extensive spaces and outdoor games for children, rustic lounge with a big open fireplace, HI FI stereo and TV sat, pergola and large outdoor spaces, guided visits and free access to the farm.